The description of iguazio's new flagship Enterprise Data Cloud platform is bold and simple: the world's fastest, simplest and lowest-cost enterprise data cloud. iguazio adds that unleashing the full potential of megatrend applications and analytics for big data, IoT and cloud-native applications, it has pioneered a new service-driven approach to enterprise data management, redesigning the entire data stack to accelerate performance and bridge the enterprise skill gap. iguazio's Enterprise Data Cloud, asserts the firm, is the only secure data platform-as-a-service deployed either on-premises or in hybrid cloud architectures, with self-service portals and APIs for developers and operators. 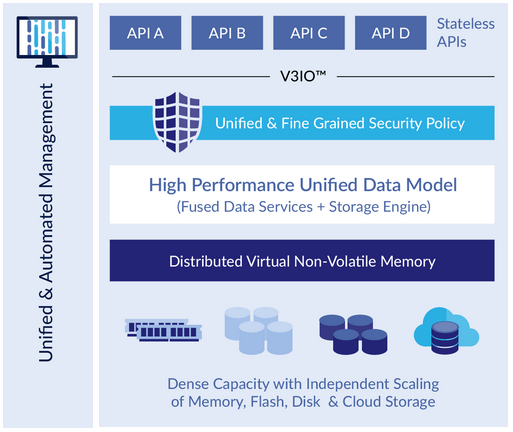 The new unified platform delivers a breakthrough in application performance and efficiency. With only four data appliances, enterprises can store up to 10 petabytes per rack, with costs starting at $0.03 per gigabyte per month. The platform delivers 10 million transactions per second and throughput of 50 gigabytes per second with sub-100 microsecond application latencies, across streaming, NoSQL, objects or files. iguazio's "revolutionary stack" supports simultaneous high-performance access through multiple industry-standard and Amazon-compatible APIs.